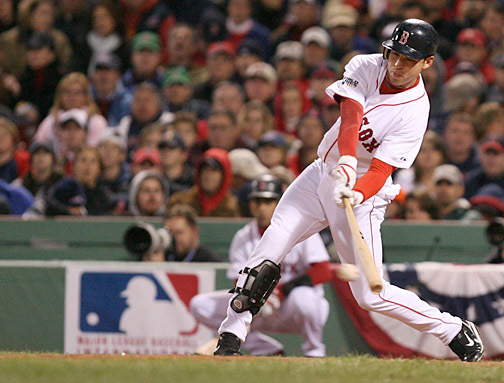 The Boston Red Sox have hit 151 home runs this season, second of any team in baseball to the New York Yankees (165). David Ortiz is leading the Red Sox with 24 round trippers, but the man who is trailing him in that category may surprise you. It’s not Adrian Gonzalez. Kevin Youkilis is not the answer, either. Nor is Dustin Pedroia or Carl Crawford. It is center fielder Jacoby Ellsbury, who has 127 more stolen bases in his career than home runs, who has knocked 22 pitches out of the park this season. Entering this season, Ellsbury had hit a total of 18 triples and 20 home runs in his four-year career. He had never hit more than nine homers in a single campaign. His only two full big league seasons, a .280/.336/.394, 22-double, seven-triple, nine-homer, 47-RBI, 50-steal, 98-run rookie year in 2008, and a 2009 in which he batted .301/.355/.415 with 27 doubles, 10 triples, eight home runs, 60 RBIs, 70 stolen bases and 94 runs scored indicated that Ellsbury could thrive with the Red Sox by getting on-base at a good clip and then use his speed to get around the bases in front of Boston’s beefy middle of the order. While most players develop more power as they age into their late-20s, the Red Sox never imagined Ellsbury would hit more than 15-to-20 homers in a season at best. At age 27 and coming back from multiple rib injuries that caused him to miss all but 18 games of the 2010 season, Ellsbury’s 2011 expedition has been a revelation. With a .313/.370/.517 batting line, he has gotten on-base in front of Boston’s RBI-guys in Gonzalez, Youkilis and Ortiz consistently at the top of the lineup. While he led the league in stolen bases in both 2008 and 2009, Ellsbury has still been able to use his speed to swipe 33 bases this season, all while zooming around the diamond to score 89 runs, good enough for third in the majors. Ellsbury, though, has always been able to get on-base and score runs successfully in the majors. The difference of Ellsbury at the plate this season is evidenced by the increased amount of pop in his swing. He has set career-highs in doubles (31), home runs and RBIs (79). With over 30 stolen bases already this year, Ellsbury is only eight home runs shy of putting himself in exclusive company. Of all the great hitters who have ever played for the Boston Red Sox, Ted Williams, Carl Yastrzemski, Jimmie Foxx, Carlton Fisk, Bobby Doerr, Jim Rice and Wade Boggs to name a few, none have ever hit 30 home runs and swiped 30 bases in a single season. Ellsbury’s power streak has been a recent phenomenon, as 13 of his 22 round trippers have come in the 39 games he has played in since July 6. During that span, he is averaging a home run every 12.69 at-bats, just above the 11.22 at-bats major league home run leader Jose Bautista is averaging to hit a homer, and well below the 22.95 at-bats Ellsbury is averaging to launch a four-bagger this whole season. However, as long as he stays healthy and stays on his current season home run pace, Ellsbury will likely become the first Red Sox to join the 30-30 club. In his only two full major league seasons before 2011, Jacoby Ellsbury proved he could be a good top of the order hitter by getting on-base and into scoring position often for the middle of the Red Sox’s order. After two good seasons in 2008 and 2009, he missed nearly all of the 2010 season, but returned with more pop in his bat than ever. Ellsbury has hit 22 of his 42 career home runs this year. He has not lost any of his speed, either, as he has swiped 33 bags so far in 2011. Ellsbury has had such a good all-around season that he may make history by becoming the first player in Red Sox history to hit 30 round trippers and steal 30 bases in one season. 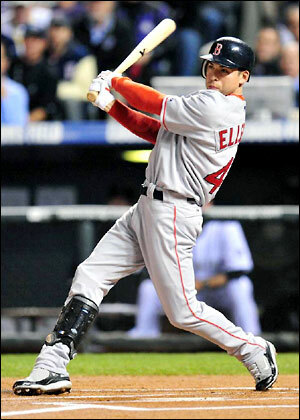 The Red Sox expected Ellsbury to be a staple at the top of the order scoring runs for a dynamic offense. They never imagined him to grow into this kind of power but he has suddenly become one of the most dangerous players in Boston’s lineup by becoming the Red Sox’s newest power threat.